…scholars have discovered that Stein’s poem exists in several versions: a manuscript that Stein wrote and two typescripts that her partner Alice B. Toklas prepared. Toklas’s work on the second typescript changed the poem when, enraged upon detecting in it references to a former lover, she not only adjusted the typescript but insisted that Stein make revisions in the original manuscript. The book painstakingly details all the edits and there are many. This edition also includes incredible prefatory essays by Joan Retallack and Donald Sutherland–as well as John Ashbery’s 1956 review of the first Stanzas. A nightingale and a robin. To have been very much absorbed. There which is not only here but there as well as there. They like whatever I like. Stein is both plangent and playful. She is looking back (it was written a year before The Autobiography of Alice B. Toklas) at her life and summoning words and phrasings that may be accidental but have a soundsphere that is stark: “may which” = “may witch”? The menacing “they” occurs all throughout the poem. The stanza above puts me in the mind of the moody, fussy relationships we try to make work–“They like whatever I like,” being the final cross through the heart. These meditations are personal, yet universal. Now they can be enjoyed the way Stein wrote them. It’s an amazing reading experience, and I mean that one is amazed at the spells she conjured through the words. Many stanzas I’ve read get at emotion circuitously? abstractly? – maybe in how the three travelers in Stalker are only 200 meters from the tip of the zone, yet it takes 90 minutes to get there. Guy Davenport said one should be issued a medal from the American Academy for reading it. Do you have your metal? But seriously, which modernist long poems do you mean? The Cantos and The Waste Land and the handful from Stevens, Paterson? It’s a cruel world Joe. I hope she finds her better self. I hope the Stein exhibit will continue on. 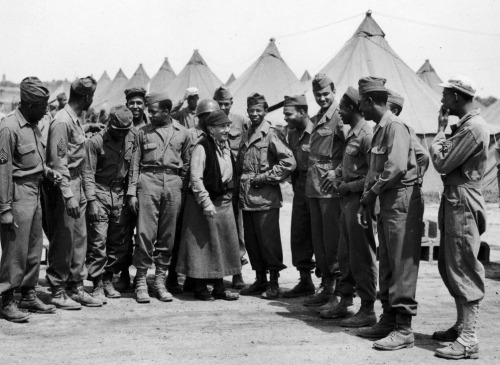 One of the most interesting parts was her with the GI’s after Europe was liberated. I know they were photo op’s but it’s also incredible.